The women today, are conquering the peaks of success with their hard work, zeal and passion to achieve big; all the way thrashing copious challenges. They stand a perfect idol for all those who dare to soar by putting high perseverance and integrity into their endeavors. 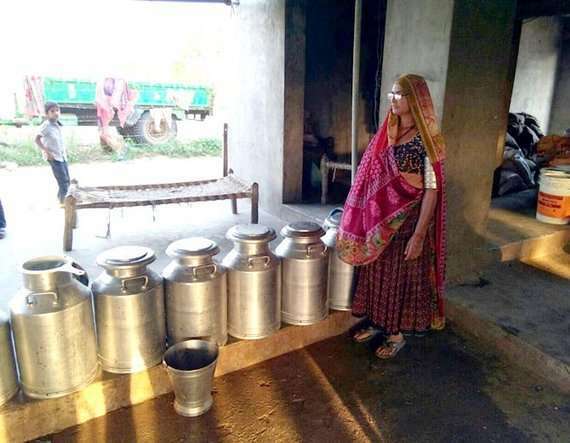 An uneducated woman from Charda village in Dhanera Taluka of Banaskatha district in Gujarat earned Rs.64.68 Lakhs by milking and depositing 600L of milk every day at the local milk cooperative society. She has been widely recognized across the state for achieving such feat and bestowed ‘Best Banas Laxmi’ award upon her along with a token prize money amounting Rs.25000 for the same. The Banaskatha district depends chiefly on farming and animal husbandry. The uneducated women here are making a headway in the field of cattle keeping and making lakhs from the same. And amongst those is Kanuben Ravtabhai Chaudhry, a native of Charda village in the Banas district, who has been associated with cattle keeping for more than a decade now. On this particular incident, Kanuben stated, “I currently own and nurture about 70-80 cows and buffalos, both small and big in total. I and my family of four along with five other caretakers manage these animals at our farm. We milk over 600L of milk every day and deposit the same at the nearby milk cooperative society which reaps us about Rs.21k to 22K per day. And as a result, we stood first in the district in the financial year 2016-17 with the highest milk collection worth Rs.64.68L. The Banas dairy facilitated me with the ‘Best Banas Laxmi’ award. Additionally, I was also awarded a prize money of Rs.25K by Shankar Chaudhry, the Chairman of Banas Dairy.” “Deducting the cost of feed, fodder, hay and other labor expenses, we’re able to save up to Rs.21L to 22L annually. Last year, the Banas dairy conferred us an award for standing second in the Banas dairy by depositing milk worth Rs.47L.” Says Kanuben while signing off.